Original Balancing Masque gently polishes skin, helps to unclogs pores and removes excess surface oils whilst hydrating skin, making it feel smoother and softer and glowing with a healthy looking radiance. Vitamins E and B5, key ingredients in this product, are effective skin moisturisers. Kaolin, another key ingredient, is an excellent micro-exfoliator that gently polishes the skin, helping it feel and look radiant. Balancing Masque also removes excess surface oil, visibly improving the appearance of oily skin. It can be used weekly as a face mask or micro-exfoliator, or on top of your pre-cleanser for a deep cleanse. After cleansing, apply the masque evenly over your face, including eyelids. Apply on top of Pre-Cleansing Oil, massage with your fingertips and then rinse off with water. 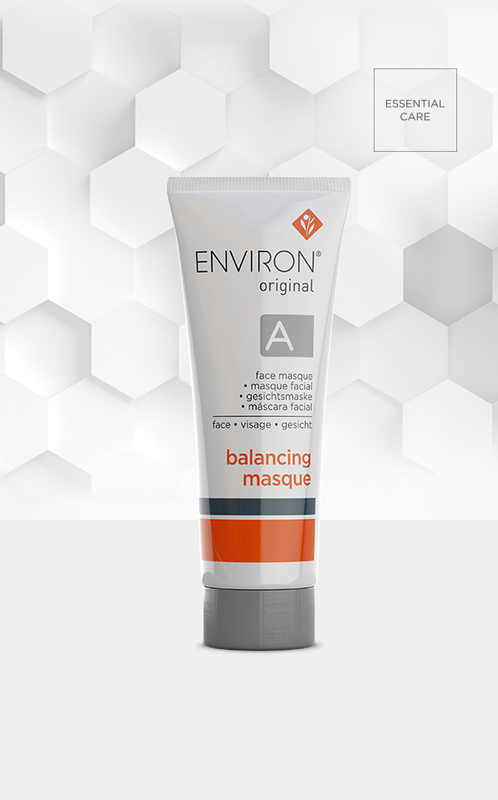 Remove last traces of the masque with your preferred Environ cleanser, tone the skin and apply your recommended Environ vitamin A moisturiser. Pre-cleanse, cleanse and then apply the masque evenly over your face. Alternatively, it may be applied over your recommended Environ vitamin A moisturiser and left on overnight for an enhanced moisturising and soothing effect.